DieTrich Thrall of BEAUTY IN THE SUFFERING during filming of “THE CRAZIES” music video on 09.21.13. BEAUTY IN THE SUFFERING on the set of the “REVEILLE” video shoot from left to right: Cory Ford, Levi Dickerson, DieTrich Thrall, Corey Henderson, Provo Provenzano. CHICAGO, IL (DLSP) — BEAUTY IN THE SUFFERING, the newly launched electro-metal studio project from producer Dietrich Thrall (MARAZENE), have shifted gears and have begun filming multiple videos to support their initial digial releases set to drop this fall. A video for the bands debut single “THE CRAZIES” was filmed this past weekend on September 21st in the Oklahoma City, OK metropolitan and the first still from the zombie-themed video can be seen below. While “The Crazies” studio recording features ANGEL BARTOLOTTA (DOPE, TEAM CYBERGEIST) on drums and CHRIS TELKES (NOCTURNE, THE RAZORBLADE DOLLS) on guitar as guest musicians, drummer CHRIS EMERY of AMERICAN HEAD CHARGE and guitarist PROVO PROVENZANO (SKINLAB, RIKETS, EVERYBODY PANIC!) are featured in the video. Band performance footage was also previously filmed in August at VOODOO LOUNGE located in the Oklahoma City, OK metropolitan area for “REVEILLE” and “JULIET“. Special guests on the pair of videos includes drummer LEVI DICKERSON and bassist COREY HENDERSON of NUCLEAR BLAST recording artists ANTI-MORTEM. Release dates for all three videos are expected in the coming weeks. The initial 3 songs as a whole will encompass music, videos, a short film, original artwork, and eventually a book which will further highlight DieTrich’s multi-media approach and vision as an artist. Dietrich is best known for his co-founding and co-visionary role in the industrial-metal band MARAZENE (later called MARAZENE MACHINE). From managing the band during its most active and successful national touring years (2006-2008), to co-producing the band’s critically hailed cover of MÖTLEY CRÜE‘s “Live Wire” in 2011 as well as the band’s lone official full-length album (“MachiNation“, 2006), to writing fan-favorite tracks such as “Give”, to guiding the band’s philosophical and edgy lyrical approach (“AnTiThesis”, “Infidel Society”), to producing multiple videos for the band, Dietrich’s contributions and influence are heavily noted. 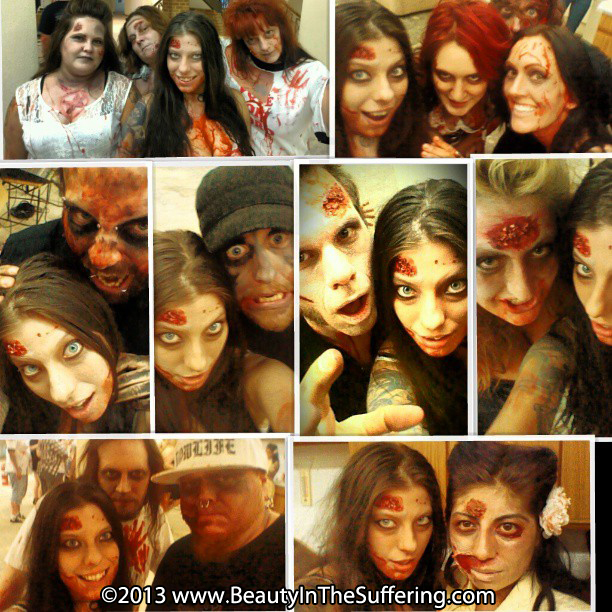 Quick pic of some of our aMAZing and cRaZy friends who took part in our video shoot for “THE CRAZIES” on 09.21.13. We couldn’t have done it without them! Kudos! 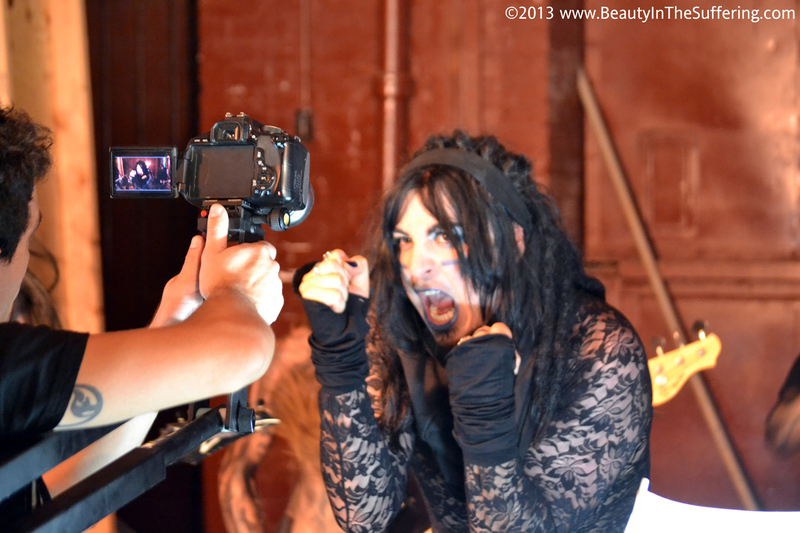 Still from the BEAUTY IN THE SUFFERING video shoot for “THE CRAZIES” on 09.21.13. DieTrich Thrall stands front and center during a take. Happy Monday morning *rawr* to y’all!! 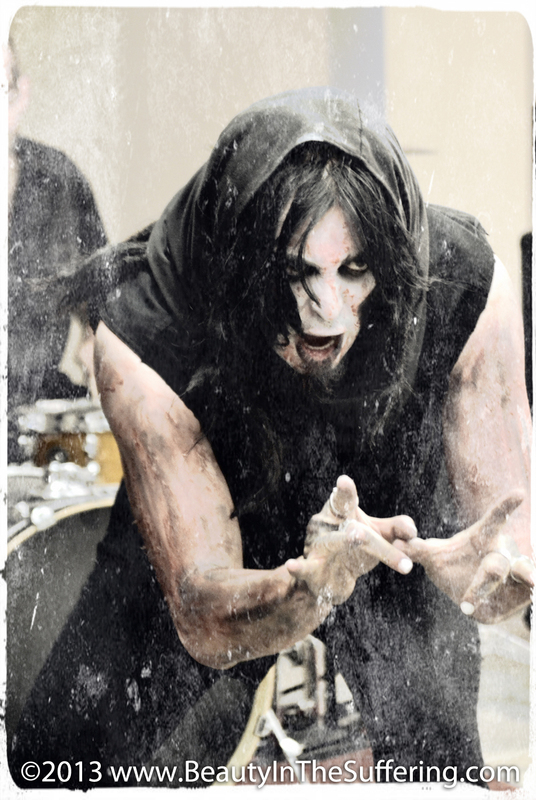 had a BLAST over the weekend with ALL things BEAUTY IN THE SUFFERING “THE CRAZIES” video shoot related and i wanted to send out a HUGE KUDOS out to everybody who came, saw, and kicked serious zombie booty! Jerry Lowlife – my director texted me at 12:30AM to let me know that the playback system we though we had lined up wasn’t going to happen. I texted jerry first to see if he was up and then to see if he knew anybody and he said he had it covered. BIG SAVE – much thanks! 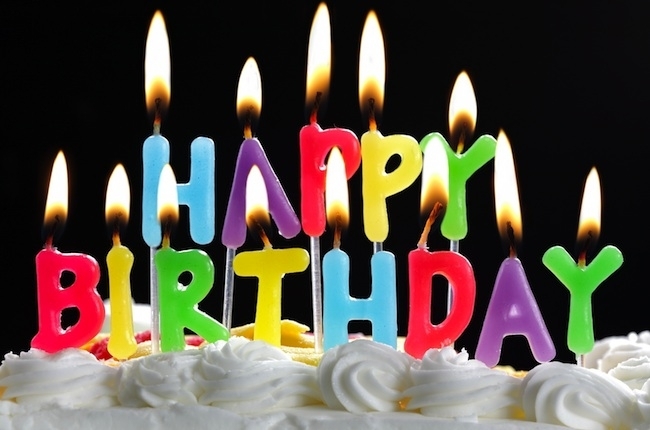 Vickie P. – Vickie got up bright and early – did some pretty spectacular zombie makeup on herself – then ran over to Susan’s house (HAPPY BIRTHDAY!!!) and helped with makeup on 8 or 9 other people.. Vickie can also take credit for kicking this entire 3-video project off by introducing me to both Jon and Mike – KUDOS! Jon Shahan and Cait Brasel for everything shoot related – was a very quick and nimble experience overall and very much looking forward to the final edit!! a bunch of new friends who i met for the first time yesterday who totally kicked AZZ yesterday!! the tons of email and text supports leading up to the event and ANYONE ELSE i am not mentioning. BEAUTY IN THE SUFFERING on the set of “REVEILLE” on 08.03.13. From left to right – Director of Photography Jonathan Shahan films Cory Ford, Corey Henderson, DieTrich Thrall, and Levi Dickerson during a take. *** September 19th – HUGE drum session Part 2 with Christopher Nathan Emery of American Head Charge (Official) – got a bunch of new tracks to add to the NINE we already have in full production..
*** September 21st – VIDEO SHOOT for “THE CRAZIES” – band performance (which Chris will be in town for) along with Corey from Anti-Mortem and Provo from EVERYBODY PANIC! *** EARLY-MID OCTOBER – filming our short zombie themed movie – details on HOW TO BE IN THE MOVIE COMING SOON! *** LATE OCTOBER – new music release date??? TBA!! THANKS again as always for your support!! 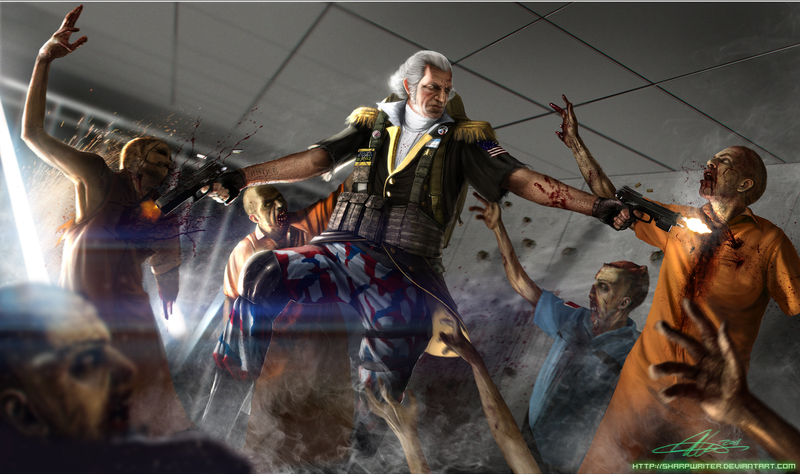 Bill Clinton’s finest hour leading the counter attack alongside the Statue Of Liberty and Ronald McDonald against those that would harm the United States and our fast food interests..
George Washington during the Zombie Revolution of 1776 waaaay back in the day. 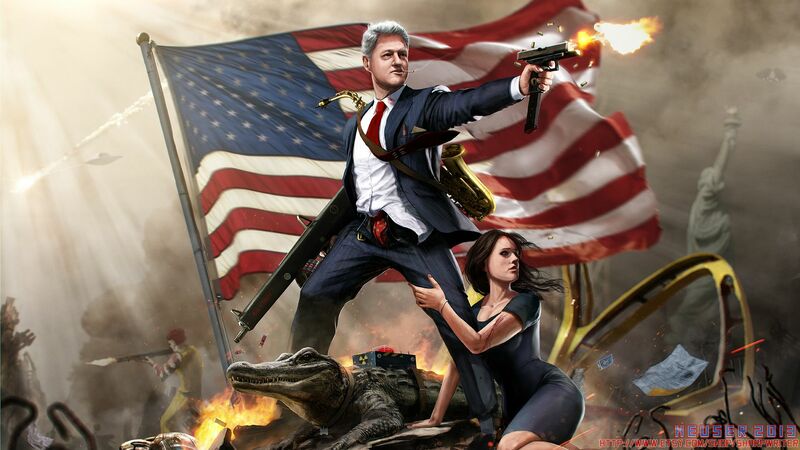 Happy Birthday US of A!! !